Cytokines are thought to play a role in acute and/or immune-mediated adverse drug reactions (ADRs) due to their ability to regulate the innate and adaptive immune systems. This role is highly complex owing to the pluripotent nature of cytokines, which enables the same cytokine to play multiple roles depending on target organ(s) involved. 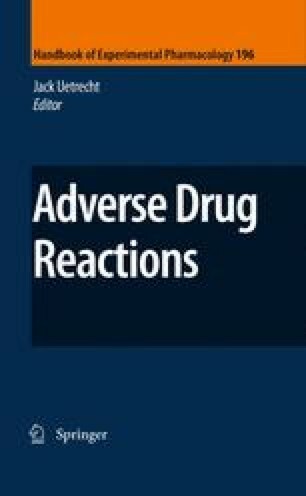 As a result, the discussion of cytokine involvement in ADRs is organized according to target organ(s); specifically, ADRs targeting skin and liver, as well as ADRs targeting multiple organs, such as drug-induced autoimmunity and infusion-related reactions. In addition to discussing the mechanism(s) by which cytokines contribute to the initiation, propagation, and resolution of ADRs, we also discuss the usefulness and limitations of current methodologies available to conduct such mechanistic studies. While animal models appear to hold the most promise for uncovering additional mechanisms, this field is plagued by a lack of good animal models and, as a result, the mechanism of cytokine involvement in ADRs is often studied using less informative in vitro studies. The recent formation of the Drug-Induced Liver Injury Network, whose goal is collect thousands of samples from drug-induced liver injury patients, has enormous potential to advance knowledge in this field, by enabling large-scale cytokine polymorphism studies. In conclusion, we discuss how further advances in this field could be of significant benefit to patients in terms of preventing, predicting, and treating ADRs.